Immunohistochemical analysis of RCAS1 using anti-RCAS1 Polyclonal Antibody (PA5-32571) in Breast Carcinoma Cancer Tissue. The recommened dilution for this antibody in immunohistochemistry applications is 1:100. PA5-18535 (0.2µg/ml) in A431 lysate with (B) and without (A) blocking with the immunising peptide, the primary antibody incubation was 1 hour and detected by chemiluminescence. 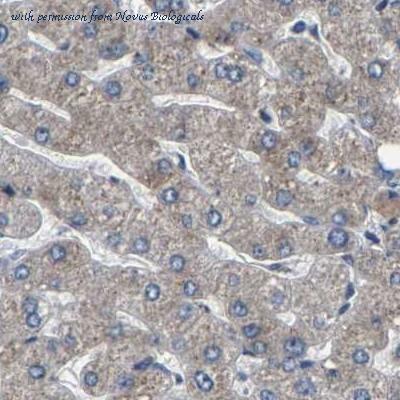 Immunohistochemistry-Paraffin: EBAG9/RCAS1 Antibody [NBP1-84922] - Staining of human liver. 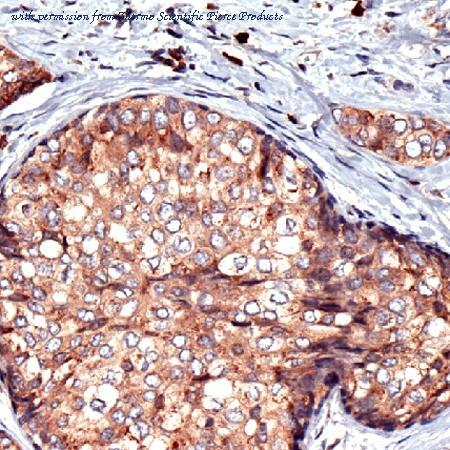 Immunohistochemistry-Paraffin: EBAG9/RCAS1 Antibody [NBP1-84923] - Staining of human lymph node. 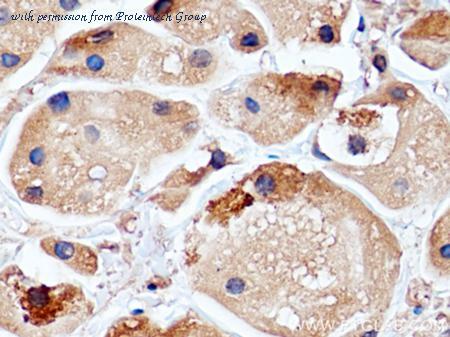 Immunohistochemical staining of human laryngo carcinoma tissue using EBAG9 antibody. Flow cytometric analysis of (mo) Thymocyte Cell using EBAG9 antibody. The RCAS1 antibody from Proteintech is a mouse monoclonal antibody to a recombinant protein of human RCAS1. This antibody recognizes human antigen. 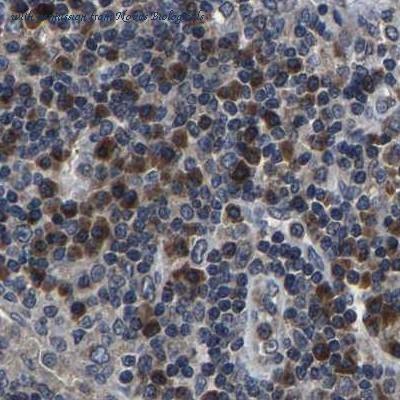 The RCAS1 antibody has been validated for the following applications: ELISA, IHC, WB analysis. The RCAS1 antibody from Proteintech is a rabbit polyclonal antibody to a recombinant protein of human RCAS1. This antibody recognizes human,mouse,rat antigen. 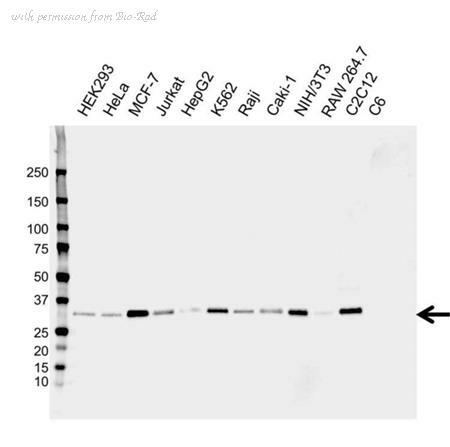 The RCAS1 antibody has been validated for the following applications: ELISA, IHC, IP, IF, WB analysis. 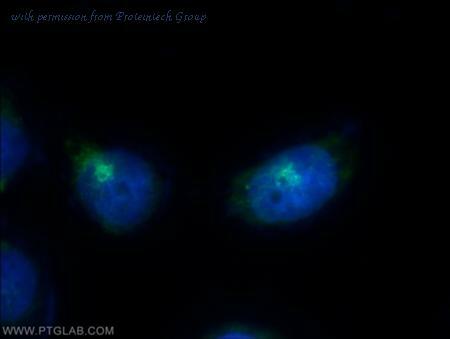 Antibody (0.2 ug/ml) staining of A431 lysate (35 ug protein in RIPA buffer) with (B) and without (A) blocking with the immunizing peptide. Primary incubation was 1 hour. Detected by chemiluminescence. 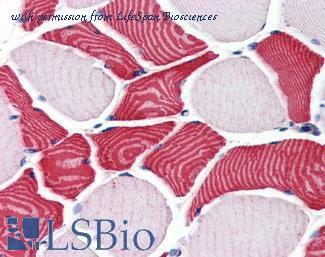 Anti-EBAG9 antibody IHC of human skeletal muscle. Immunohistochemistry of formalin-fixed, paraffin-embedded tissue after heat-induced antigen retrieval. Antibody concentration 75 ug/ml.